In an effort to better organize my website, I'm compiling status updates by subject. 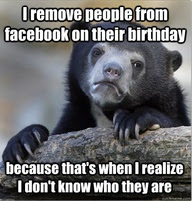 Whether it's your birthday or a Facebook friend's birthday, you can count on my FACEBOOK FANS and myself to help you avoid the obvious "Happy Birthday" wall post, which is almost worse than writing nothing at all. These have been collected over the course of several years. You may see a status update you have seen before. If this angers you, please send an email to my assistant at idonthaveanassistantyouidiot@yahoo.com. Thank you! Do you have a Facebook Status update about birthdays and you'd like to receive a virtual pat on the back? Post it on my FAN PAGE.